With an elevation over a mile-high(5640 ft), Christopher Creek Campground’s crisp, fresh air and vibrant views are a joy to behold. The facility is tucked along the banks of the spring-fed Christopher Creek, which passes just below the Mogollon Rim. 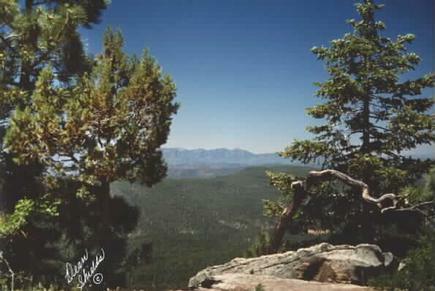 The Mogollon Rim, pronounced by locals as “muggy-own,” is a 200-mile long cliff in northern Arizona that ranges between 5,000 and 7,000 ft in elevation. The unique landscape was created by extreme erosion and faulting that has sculpted spectacular canyons and buttes. 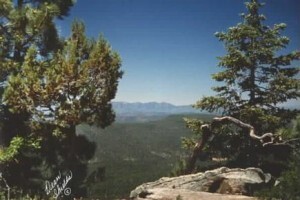 The rim serves as the geographical dividing line between the cool high country above and the hot, dry desert below. Christopher Creek is located in the desert portion, but is balanced by the cool waters of the creek and forested surroundings. After a day of horseback riding or mountain biking, take a dip in one of the facility’s three swimming holes to cool off from the summer sun. Or if winter is more your thing, visit during the snowy months to take advantage of the miles of cross-country skiing available. Each spring, the creek is stocked with rainbow trout, allowing anglers the opportunity to cast their hearts out for rainbows as well as brook and brown trout. The small town of Christopher Creek is just a short drive away and offers a few restaurant options for those who tire of cooking at the campground. A series of lakes called the Rim Country Lakes are about a 10 minute drive east. Woods Canyon Lake is one of the most popular recreational lakes in the state and offers options for boating as well as a nature trail that loops around the lake’s perimeter. Information courtesy of recreation.gov; learn more here. Posted on August 4, 2014 by League Staff in The Great AZ Road Trip | Tags: camping, Christopher Creek, outdoors, Parks, Prescott Area, recreation, Rim Country, Star Valley, summer | permalink.